Mee Mee breast pump is designed especially for modern day mothers who insist on feeding breast milk to their babies, despite their hectic work schedule. Comfortable for mothers and safe for babies, this electric breast pump is easy to operate. It conforms to FDA standard and is made from food grade materials. The unique double valve design of this Mee Mee feeding system allows repeated suction for creating more milk flow. Operated by batteries or the adapter provided, this breast pump is quite discreet to use. This electric breast pump comes handy in such situations and lets the mother store breast milk at convenience for later use. 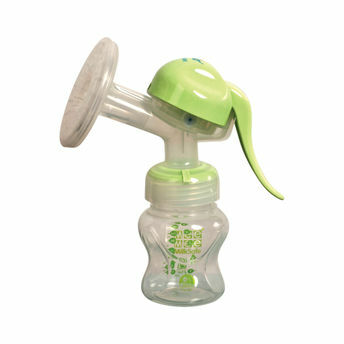 The Mee Mee feeding breast pump features a unique training cup that allows the mother to increase the suction speed, thereby fastening the process of expressing milk. It's even possible to adjust the pressure with a built-in release button of this electric feeding pump. Being lightweight and portable, you can easily carry this compact breast pump Mee Mee in your handbag, especially during long journeys. All components of this feeding pump that come in contact with human body or breast milk should be sterilized before use.